Okay, so maybe not the best idea the first time making Jam to choose a recipe from The Dutch Oven. Alas we were so eager to use our freshly picked strawberries and thought what better way to preserve this perfected locally grown fruit than to use the recipes our grandmothers would have used. Well it seemed like a good idea…unfortunately The Dutch Oven Cookbook doesn’t come with a grandmother to walk you through the recipe. 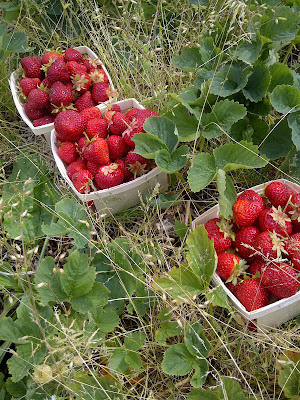 The strawberry season is short in Nova Scotia, but oh so sweet! 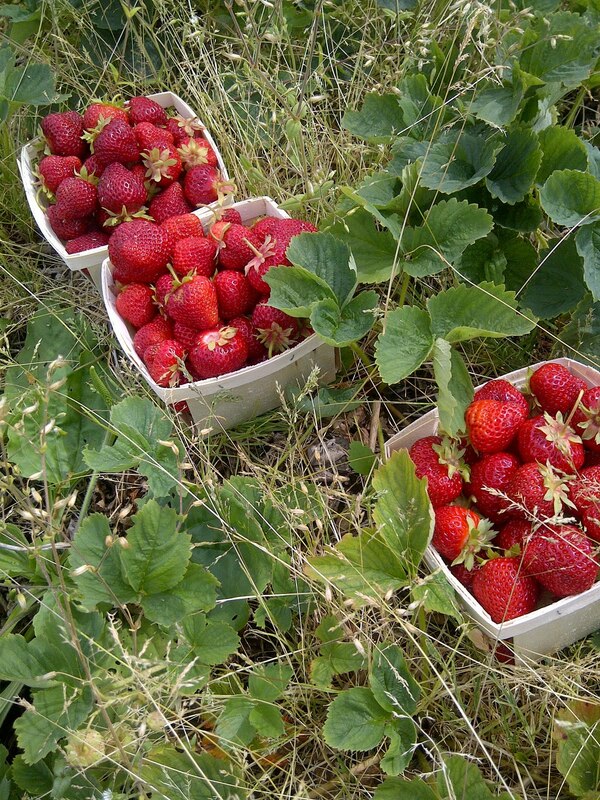 Don’t be fooled by those strawberries in the plastic clamshell in the Supermarket – while they look tasty enough, they don’t compare to the juicy, succulent flavor of a locally grown berry. 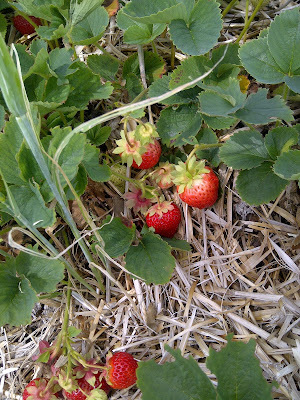 We began our strawberry jam making process in the garden, literally – we picked our own berries for this recipe. 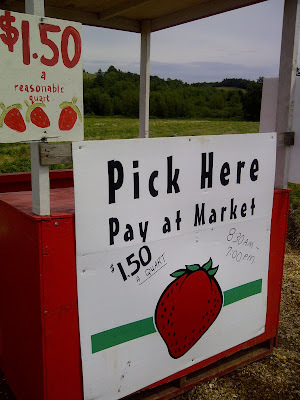 We ventured down Nova Scotia’s South Shore to Indian Garden Farms near Hebville. A U-pick farm and market with all kinds of locally grown goodies. At a buck fifty a pint, it makes it well worth the gas and extra effort – plus there’s just something so satisfying from taking produce you pick with your own hands and transforming it into something so delicious! 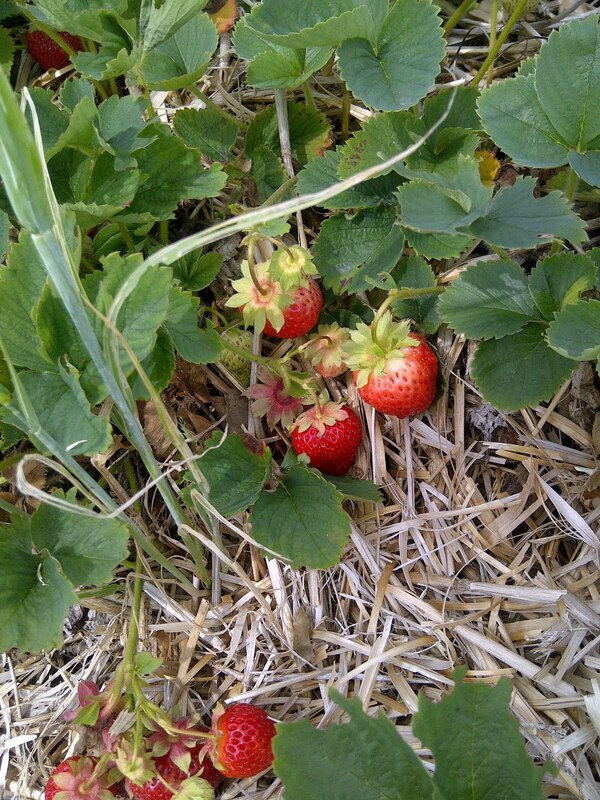 As we mentioned – The Dutch Oven’s recipe for strawberry jam is an old one, much like the kind of jam our grandmothers would have made before pectin was commercially available in supermarkets. The idea is that the fruit and sugars are cooked longer to ensure the jam reaches a gel stage by use of its own natural pectin. Although we followed the instructions implicitly and even referred to our Bernardin cookbook, we didn’t seem to achieve the correct gel stage. We’ve since received many tips on the subject – from adding an apple during the cooking process to performing an ancient granny jam dance around the pot. We welcome any suggestions and wish you better luck should you attempt this one. Combine berries and water. Add 2 cups of sugar. Bring to a rolling boil. Boil hard for 3 minutes. Add 2 more cups of sugar. Bring to a rolling boil. Boil for 3 minutes. Add 2 more cups of sugar. Bring to a rolling boil. Boil for 3 minutes. Pour into sterilized jars and process. As mentioned above we did receive a few suggestions after the fact which may give you a leg up should you try this one. Try throwing an apple in during the cooking process. Apples have lots of natural pectin which may help with the thickening. Our berries may have also been slightly over ripe, after spending the day trolling the South Shore for berries and hangin’ out people watchin’ at the Tastee Freeze in Hebville – we were much too tired to make Jam and ended up doing it the next day. Bernardin suggests using a mix of ripe and less ripe berries as the less ripe ones would have more pectin. That’s about all we’ve got! 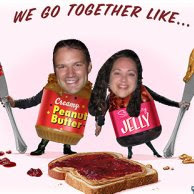 We loved the flavor of this jam. Through the longer cooking process you end up with a jam that is slightly darker in colour with a rich caramelized flavor. Although slightly runny it’s still mighty tasty on a biscuit. No doubt it will also make a great sauce on ice cream. Oh!, we almost forgot – although our Jam may not have turned out the best – it does look fabulous in these new canning jars we recently discovered. Weck (pronounced Veck) jars are produced in Germany and come in a wide variety of funky shapes and sizes – a welcomed change from the traditional canning jars. Check’em out here – and for our local readers – check out Weck Canada, a supplier right here in Nova Scotia! Punch it up a Notch! Who knew that rhubarb could be such a versatile vegetable? We can now add drinks to our ever-growing list of recipe uses for rhubarb. Summer has made a late entrance this year in our end of the world – but with the sun shinin' and the temperature risin', it’s the perfect time to prepare this cool and refreshing, sweet and tart summer drink. If you’re lucky, you can still pick up some fresh rhubarb from your local farmers’ market (we spotted some last week at the Halifax Seaport Market), otherwise frozen will work just fine. Cut rhubarb into small pieces and cook in 1 quart of water until rhubarb is soft. Strain liquid through cheesecloth (if you’re fresh out of cheesecloth, a strainer will work just fine). Discard rhubarb. Add orange juice, lemon juice, sugar syrup and salt to rhubarb juice. When ready to serve – pour over ice in punch bowl and add mineral water of ginger ale. Allow to get very cold. Makes 8 regular glasses, or 24 punch glasses. This recipe was pretty straight forward to prepare, no big surprises. We reduced the recipe to half as we didn’t want a large amount and this worked just fine. This recipe is delicious as is, however if you want to really get the party started you could punch it up a notch, German style, by using sparkling wine instead of mineral water or ginger ale. Check out Wines of Nova Scotia for some great local options.